"Diving Deeper Into Internet of Things (IoT) & Cloud"
Test Automation Framework is a scaffolding that is laid to bring an execution environment to develop, perform and report the automation test scripts effectively. In a very simple language, the framework is a constructive blend of various guidelines, coding standards, concepts, processes, project hierarchies, practices, reporting mechanism, modularity, test data injections etc. to pillar automation testing. A divergent range of Automation Frameworks is available at present. These frameworks may vary from each other based on their support to various key factors to do automation like scalability, reusability, ease of maintenance modularity, and more. In order to maximize the benefits, testers use more than one framework. However, multiple approaches create confusion that increases the chance of errors as well. Which means, it is important to choose an ideal framework to get the benefits like maximum coverage, minimum manual intervention, and easy reporting. 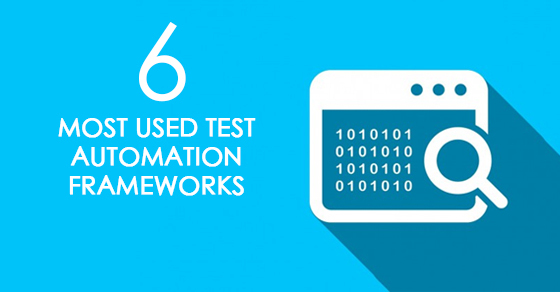 Now, let’s discuss in detail about the 6 most popularly used Test Automation Frameworks in Mobile App Development. Module Based Testing Framework is based on Abstraction, the popular OOPs concept. During testing, the framework breaks down the application module wise to a number of logical and isolated modules. For each module, an independent and separate test script is created. These test scripts together build a larger test script representing more than one modules by using a master script to achieve required scenarios. This master script is used to call the individual modules to run end to end test scenarios. Each module is separated by an abstraction layer so that, any change in the section doesn’t affect the other modules. In this framework, testers write function libraries to use it whenever required. This is modularity framework or module-based framework. The Library Architecture Testing Framework is built on Module Based Testing Framework with some additional advantages. Rather than dividing the application under test into test scripts, all test cases are analyzed to find the reusability and segregate the application into functions that can be used by other parts of the application as well. In short, the test case will be fragmented into functions, instead of separating the application into test scripts. Thus, a common library is created comprising of common functions for the application under testing and will be stored in other files. Therefore, as per the requirement, these libraries can be called from the test scripts. This framework is most used for inventory management systems, where common activities are repeated frequently. In certain cases, it is required to test the same functionality multiple times with the different set of input data, which means we can’t let the test data embedded in the test scripts. Hence it is advised to keep these test data in some external resource and it can be property files, XML files, MS Excel Sheets, text files, MS Access Tables, CSV files, ODBC repositories, SQL Database, etc. By segregating the test scripts logic and the test data from each other, Data-driven test automation framework allows testers to create test scripts by passing different sets of test data. Here, data can be accessed within the test scripts using the key as the data is stored in “Key-Value” pairs. This framework significantly reduces the number of test scripts required to cover the test scenarios compared to the module-based framework. The Keyword-Driven Testing Framework is derived from Data-driven Testing Framework, as it segregates the test data from the scripts and also keeps a certain set of code into an external data file. The keywords and the test data are stored in a tabular structure and thus, popularly known as Table Driven Framework. Here, the test data and keywords are entities independent of tools being used. Moreover, it doesn’t require you to have a coding knowledge and offers the same benefits as data-driven testing. It allows testers to create multiple keywords to associate a unique action or function for each of these keywords. It also helps testers to create an Action or Function Library that holds the logic to read keywords and invoke the associated action. Hybrid Testing Framework is a combination of more than one framework and any frameworks can be incorporated to build a hybrid framework, based on the situation. The best thing about such a setup is that it leverages the benefits of all kinds of associated frameworks. It allows data-driven scripts to take advantage of the powerful libraries and utilities in a keyword-based approach. This framework can leverage the advantages of all associated frameworks for the particular test environment it manages. Behavior Driven Development framework allows to create a platform for functional validations in an easily understandable and readable format to Developers, Business Analysts, Testers, etc. Such frameworks do not necessarily need to have a knowledge of programming language. Behavior Driven Development framework uses a table of conditions, where testers provide input in the table and expect output. Some of the market available for Behavior Driven Development framework is cucumber, Jbehave etc.